How time flies... 12 years ago I was writing my first hi-fi reviews for an internet magazine, and at about the same time a small manufacturer from Germany was making a name for himself as a manufacturer of basic looking, but far from basic sounding phono-stages. 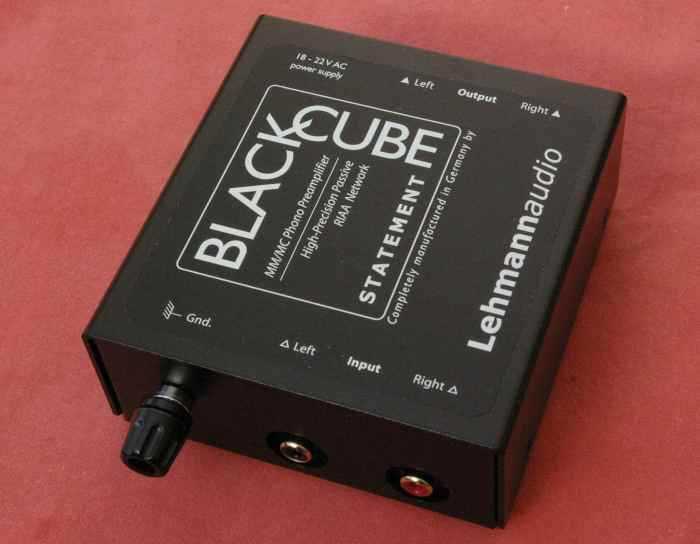 The link here is the Internet, because the Lehmann "Black Cube" was probably the first hi-fi product to have its reputation, and subsequent success built on reviews (not least on TNT) and forums on the net. Its success was easy to understand. At a time where fewer and fewer amplifiers were equipped with phono stages a gaping hole in the market emerged - the surprise was that the keenly priced "Black Cube" abandoned glitzy casework and used the cash saved on components, giving a performance that shamed some very expensive alternatives. I would be going too far to say it turned the market on its head, but it made an impact far greater than anyone would have thought possible from a little company. Having read the above, a reader might be led to expect the Statement to be a bargain-basement stage, but that would be missing the point. The original Black Cube was never meant to be cheap, but rather to demonstrate what could be done when a reasonable amount of money was directed into the guts of a product rather than the box and marketing. The Statement follows this tradition, it is in a basic (though well made) black, steel box. The power supply is a simple AC wall-wart, though heavier than I've come to expect, the power supply regulation etc being done in the stage itself. Inside you'll see the hallmark Lehmann construction of a very neat, double sided layout using decent components. 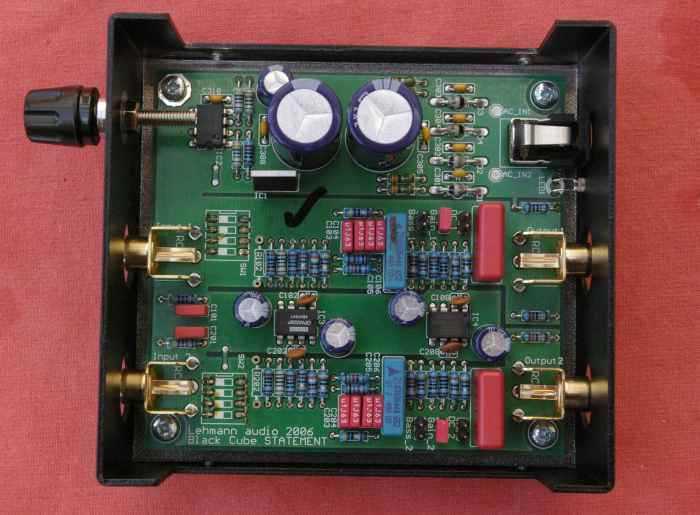 The design uses two dual op amps, one for the first gain stage, both channels and one for the output stage both channels. Gold plated sockets are soldered direct to the board - it all looks neat, well thought out and functional (if you want the gory details go take a look at the manufacturers .pdf file on the technical spec). However the basic appearance belies the fact that the Statement is a very flexible stage, offering not only the usual MC/MM option, but also variable loading via DIP switches. Opening the box reveals two empty slots for custom resistors so that any loading can me accommodated. Even more unusual is that by replacing jumpers a gain of +10 dbl overall can be switched in for level matching, and a bass filter (we used to call them rumble filters), gently rolled off from 60Hz, can also be added if needed. As I've said many times before I'm not possessed of golden-ears. However I am very sensitive to things being wrong. I know this might sound a fine distinction but it's not. I've had many a happy hour sitting in front of the built in phono stage of the TCC pre-amp costing under 100 Euro simply because though its phono stage is nothing exceptional, it doesn't really do anything wrong. On the other hand, the old Trichord Dino, a stage which was an order of magnitude superior in just about every respect, had a hint of grainy, harsh, extreme top-end, which once I'd spotted it, irritated the knickers off me. Likewise the Kuzma Stabi S had a hint of wow that drove me nuts and so on. So for me to like something it first has to do nothing wrong, and as I'd expected from previous experience with the Lehmann stages, this little box proved very pleasant to sit in front of i.e. no nasties:-) I'm fortunate enough to have the Black Cube SE twin here as a reviewing tool for my turntable reviews, and this sits two steps up the Lehmann ladder from the Statement. This is now the latest version updated from the original test, and is even better than the original. This is basically the standard Black Box but with a much larger power supply and of course I'd expect it to show the Statement a clean pair of heels as it costs over twice as much. On the other hand it'd be interesting to see just how much of the magic was lost in the cheaper stage. First off I wired the Statement into my budget reference source, a Thorens TD160s with Rega arm and Goldring Epic MM cartridge. This I still put through a review system consisting of the Lehmann Stamp/Linear amps and powering a pair of Trivox Pure S a very revealing system. In this configuration the Statement really shone, the soundstage wide if a little diffuse, and a nice snappy bass. Detail was just fine and though the overall sound was a bit lightweight the result was pleasant enough. Replacing the Statement with the SE gave little advantage, perhaps the soundstage gained a little solidity, but to be honest the better phono stage hardly justified its existence. Looking at that test system, it's obvious that the source is really the weakest link, in particular the 30 Euro cartridge, so the next step was to run the same system but using the my Opera Droplet LP5.0 , dynavector 507/DRT1s. This rather tips the balance the other way, with the source now coming from a price point well above the rest of the system, including both phono stages. The logic being that now the source will no longer be the limiting factor. Now the character of both stages became much clearer. Again the Statement made a fine effort and the better source allowed it to show a soundstage with depth as well as width and a fine sense of pace. The SE now pulled out a clear lead, most noticeable was a sense of focus it gave to the soundstaging. The Statement could sound rather diffuse, almost as if phase wasn't handled quite as well as the SE, this isn't really a criticism of the Statement, it does well in this area, but the SE was clearly better. Perhaps as a result of this the SE also gave more of the sense of ambience of a venue. So with something like Madonna's "Confessions" the various electronic effects were a little "fuzzy" on the Statement, and the street scene from "I Love New York" rather flat in comparison with the SE. To up the anti even further I now put the stages into the full-range system of the SQF Son of Pharao and the new B&C Consonance M15 full range horns. Though this system doesn't have quite the delicacy, imaging and speed of the Trivox system, it does have massive dynamics and scale coupled with a response down to 20 Hz. This system showed another area where the SE had an advantage, and that was in the area of bass control and extension. The Statement was again perfectly agreeable to listen to, but the SE added some real punch in the bottom octave and seemed to play bass tunes slightly better. Although the M15's don't image like the Trivox, they still showed the superior focus of the SE. What I was trying to pin down was at what point does the Statement become the limiting factor. Certainly with a budget turntable the Statement is going to do just as good a job as the SE - it really isn't worth the extra, and remember that in my test that budget turntable was firing into a system several rungs further up the hi-fi ladder, with a more balanced system, say a 300 Euro amp and Speaker combination, the Statement would be even less exposed. Beyond that, when the budget goes up the SE shows enough superiority to more than justify its extra cost. In isolation how does the stage fair? In character it is fast detailed and open, it doesn't flatter and warm the signal, rather puts forward an honest and detailed view of events. In this respect it is very much in the Lehmann tradition and much the better for it. Even in a high-end system it doesn't really sound exposed and if you hadn't heard what a better stage was capable of you wouldn't really suspect the Statement would be the limiting factor. This is an excellent result, and rather different from the case where a component sounds obviously out of its depth, for example my old TD160s sounds quite compressed, harsh and lightweight in the M15 based system. Ultimately it doesn't have the focus of a better stage, or the bass control and depth, but you need to be in a system well beyond its price point to find this out. One particularly heartening aspect is that detail retrieval is truly excellent, regardless of system used, you don't find things getting lost in a complex mix and lyrics (always tricky) are easy to follow. The other big plus is the flexibility of the stage, including custom loading of cartridges. All too often budget stages fall down because they either can't load decent Moving Coils, can't provide enough gain to make them work properly, or are simply too noisy to be practical. The Statement manages all this and the low noise performance is especially impressive. The bottom line is that once purchased, the Statement is capable of growing with your system, from decent MM cartridges right through to more expensive MC's, though as stated above the journey cannot be endless and at some point a better stage is easy to justify. Often when a manufacturer starts off and builds a reputation with a "value" product, the following years see a steady move upmarket, lured by bigger profit margins and delusions of grandeur. To a certain extent Lehmann Audio have done just that, but at the same time they haven't abandoned their roots, or their philosophy of offering something of real value to the struggling audiophile. The Statement is a fine and flexible phono amp from a well-established quality manufacturer that offers good value - no more, no less.